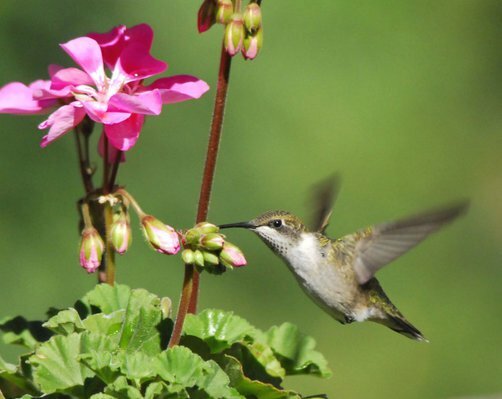 The arrival of the ruby throated hummingbird enlivens many gardens and yards with it’s presence. An Indiana Inn and Spa, Songbird Prairie sited the first arrival on April 29th. Males are fiercely combative and will defend a single nectar source against all comers. Spectacular flights, constant chittering, the the low hum of beating wings, and the occasional smack of tiny bodies colliding is familiar to anyone staying here at Songbird Prairie Bed and Breakfast, Valparaiso IN. Seen in direct sunlight, the male’s ruby throat patch dazzles. Both male and female are iridescent green above. The female’s underparts are white, and she sports white spots on her rounded tail. Males appear smaller and darker overall with grayish-olive underparts and a slightly forked all dark tail. A squeaky chip is uttered constantly while feeding. It’s almost like the male is talking, “this is my nectar feeder, find your own”. Males sing a seldom heard, monotonous song from exposed perches at daybreak. Rubythroats prefer mixed deciduous woodlands with clearings, where wildflowers and abundant small insects can be found. They’re fairly common in forested areas across the entire eastern US, falling off abruptly at the great plains. Virtually all rubythroats leave for the winter, many making the arduous nonstop flight across the Gulf of Mexico on fat reserves alone. Ruby throats winter in Central America. 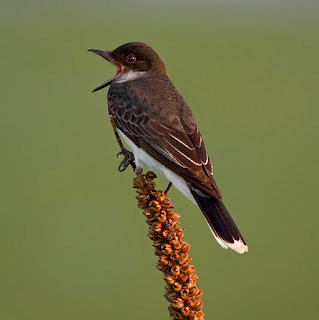 Though they are usually regarded as wholly insectivorous, ruby throats take a great number of small insects, which they catch by gleaning or in aerial pursuit. They may even rob spider webs of their catch. They are strongly attracted to red or orange flowers, but rubythroats will take nectar from flowers of any color. They hover and probe rapidly, often perching to feed. Here at Songbird Prairie Inn and Spa in Northwest Indiana, you will see them perching all the time as they feed on the various nectar feeders. Once a male rubythroat has mated, his investment in the offspring is over. The female constructs a walnut-sized, thick-walled cup of plant down and spider silk, bound tightly with elastic spider web and encrusted with lichens. This well-insulated nest protects the two lentil-sized eggs when she must leave to forage. The young hatch after about 13 days and remain in the nest for about 21 days. The female regurgitates small insects and nectar into their crops. They are fed for at least a week or longer after fledging. Attract rubythroats with a 1:4 solution of white table sugar and water that is boiled for 2 minutes. Wash feeders with hot soapy water and rinse well every few days. Artificial coloring in unnecessary. To thwart a bullying male, hang several feeders within a few feet of each other he’ll be unable to defend them all. in Northwest Indiana to watch the male attempt to drive out his rivals. The rich and burbling song of the house wren is surprisingly loud for such a tiny (4 3/4 Inch) bird. House wrens are named for their preference for living in the close proximity to humans, often in tiny houses we provide. This mostly plain brown bird makes up for it’s small size and drab coloration by being a fierce competitor for nesting boxes. 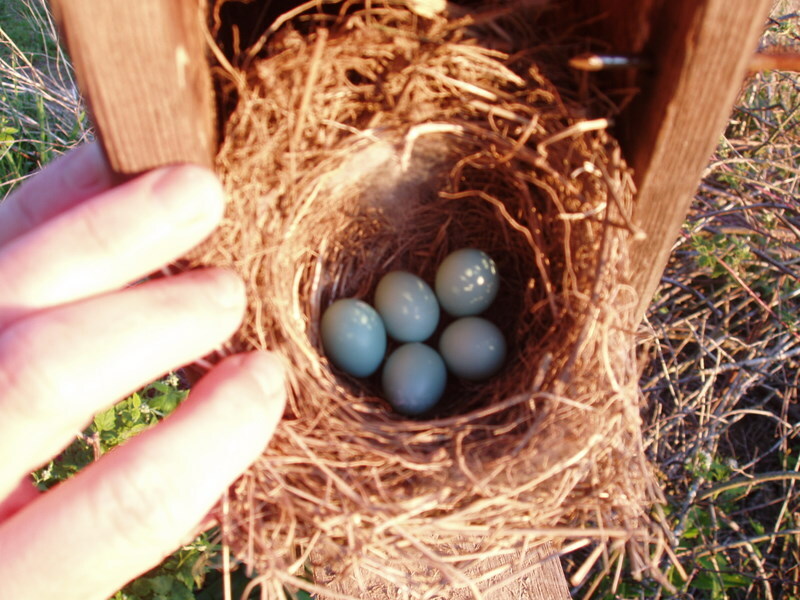 House wrens nest in a variety of cavities from woodpecker holes to natural cavities and nest boxes. They will also nest in flowerpots, drainpipes, and other such sites. They are very competitive about nesting sites, often filling all or most available cavities with sticks. The male builds these “dummy” nests, and the female selects one in which to nest. The twig structures are lined with soft materials, such as grass or hair and the female lays six to eight eggs. She performs the incubation duties, which lasts from 12-14 days. 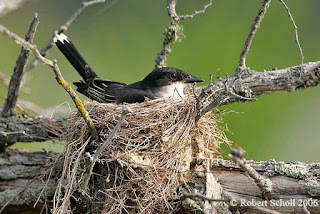 Fledglings leave the nest two or more weeks after hatching. 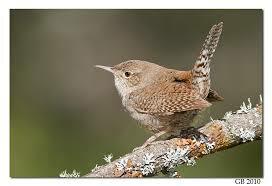 House wrens are known to pierce the eggs of other cavity nesting birds in their territories. House wrens are notable for their lack of field marks. The warm-brown upper parts and tail are matched by a grayish breast. Looking closely, you will see a variety of small white and black spots, the only variation in the bird’s plumage. Males and females look alike and both have the wren like habit of cocking their tails up when perched. The thin, slightly curved bill is ideal for capturing and eating the house wren’s insect prey. They spend their summer in thickets and bushy edge habitat to woodlands. The house wren is a familiar bird in parks, backyards and gardens near human settlements. Their diet is insects; grasshoppers, crickets, spiders, and moths, but they will also eat snails and caterpillars. Come to Songbird Prairie to see the small bird and hear them through the microphones with their powerful song. Today the rose breasted Grosbeaks returned to the feeders. With it’s triangular scarlet breast patch, black back and white underparts the male rose-breasted grosbeak is a North American beauty. This gorgeous songbird remains plentiful in a variety of habitats. Songbird Prairie is a certified wildlife habitat. The male’s robin like song is punctuated by a chip. I think it sounds like a robin with a cold. I think they are so striking in flight, the male flashes rose-red under his wings with a wide rectangular white wing patch, just gorgeous. The female has a dramatically different appearance. She resembles a large finch, streaked below and has a broad white line both above her eye and below her dark ear patch. In fall, immature males look similar by having an orangey wash across the underparts. The grosbeak prefers to nest in open woodlands or at a forest edge. They vacation over the winter in the tropics. What a long flight! It has a versatile, heavy bill, and feeds both on vegetable and animal matter. During fall migration, it mostly east berries and seeds. including sunflower seeds. That is why they stay at the feeders for several minutes. Insect prey in summer, may include beetles, bees, ants, bugs, and caterpillars. The female grosbeak builds her nest in a tree or tall shrub usually between 5 and 20 feet above the ground. Assisted a bit by the male, she works twigs, weeds, and leaves into the loosely woven open cup nest then usually lays four eggs. Both parents incubate for about two weeks, then feed the nestlings, which leave the nest between 9 and 12 days. Why they are so plentiful here at Songbird Prairie, their diet consists of elderberry, juneberry, raspberry, blackberry and mulberry, all of which we have here. They are a beautiful sight. You may view them while you are enjoying your breakfast here at Songbird Prairie Inn and Spa, here in Northwest Indiana. Cone to have Breakfast With The Birds! 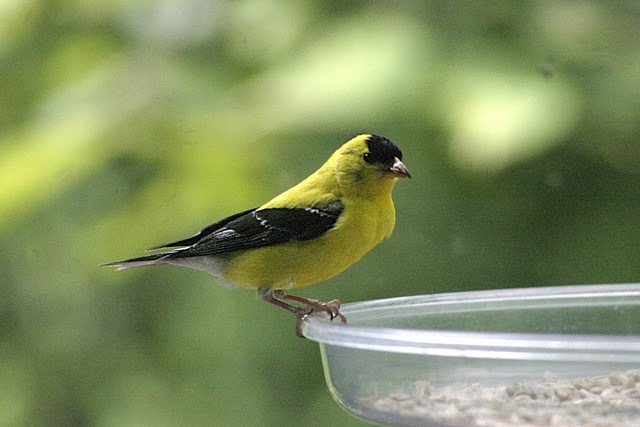 American Goldfinch is a permanent “guest” at Songbird Prairie Inn and Spa! 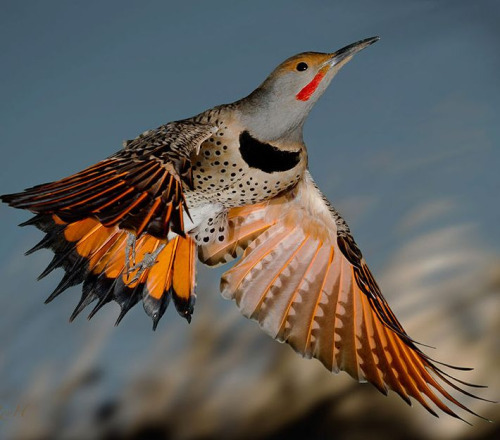 One of our favorite birds, a familiar and fairly large (13 inches long) woodpecker, the northern flicker is a distinctively marked bird that unlike other woodpeckers is often seen foraging on the ground. The Eastern form of the flicker is known as the yellow-shafted flicker for it’s bright lemon-yellow underwing and tail color. The field marks are bright yellow wing flashes, white rump, spotted breast, and barred back. It is not easily confused with any other bird. In the east, both male and female have a red crescent on the back of of the head, but only the male shows a black “moustache” mark on the cheek. The flicker has several calls including a single note kleer, a short wickawickaseries, and a monotonous wickwickwickwick song. It also communicates by drumming on the resonating surface of a tree, pole, or even metal downspouts and chimney flues. The flicker is widespread across Northern America. We see them all spring, summer and fall here at Songbird Prairie Inn and Spa, Valparaiso, Indiana. They are found everywhere wooded habitats exist though open woods and woodland edges are preferred. Songbird Prairie is a certified wildlife habitat. Flickers migrate southward in winter. 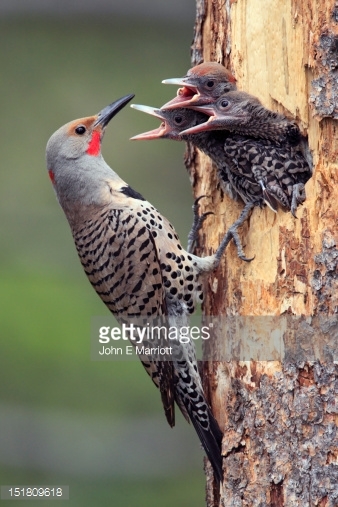 Flickers feed on the ground where they specialize in eating ants. A flicker pokes its long bill into an anthill and uses it’s lone, sticky tongue to extract the ants. They also eat other insects, as well as fruits and seeds. At bird feeders, they will eat suet, peanuts, fruits, and sunflower bits. Excavating a new nest cavity almost every year, flickers perform a much needed service for may other hole nesting birds from chickadee to ducks that use old flicker nests. Both the male and female excavate the nest cavity in a dead tree or branch. The female lays between 5 and 10 eggs both share the 11 day incubation period. 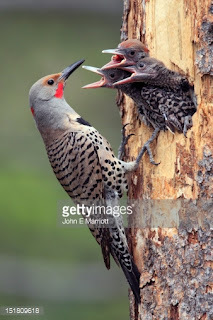 Young flickers leave the nest after about 25 days. Flickers use nest boxes with an interior floor of 7 x 7 inches, and interior height of 16-24 inches and a 2 1/2 inch entry hole. Because excavation is a vital part of courtship, boxes packed full of wood chips are more attractive. Competition for cavities from European starlings is fierce and may be causing a decline in flickers. 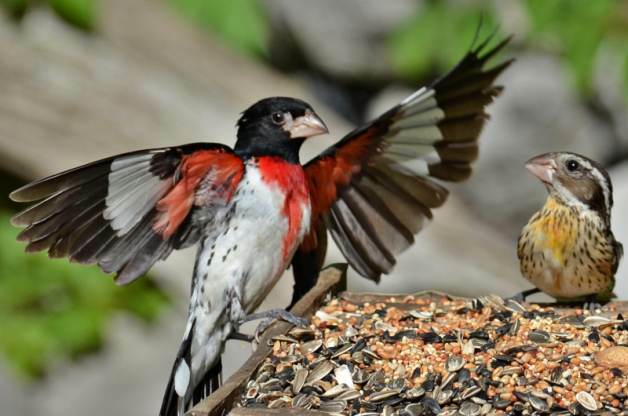 Offering suet, corn or peanuts and nest boxes in your wooded backyard is one way to attract flickers. Equally important is the presence of ground dwelling insects (leave those non threatening anthills alone) and dead trees or dead branches. 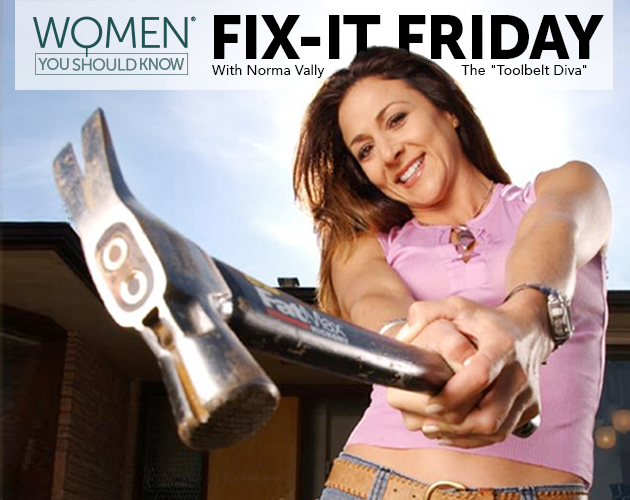 A large dead tree branch placed vertically in your yard may entice a flicker to stop. As you walk the grounds of Songbird Prairie’s 6 acres, you will find may dead trees left to entice all species of woodpeckers. 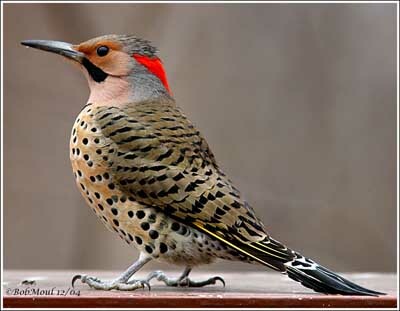 Come to Northern Indiana to discover the Norther Flicker. Is your mom a “Red Hatter” or a Tool Belt Diva? 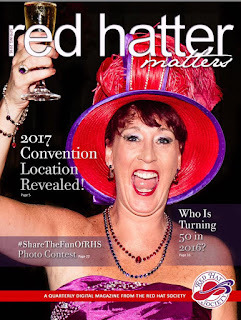 Whether she’s a “Red Hatter” or a “Tool Belt Diva”, plan a night reminiscing with Mom at Songbird Prairie Inn and Spa. Remember those breakfasts in bed, where you served her burnt toast and cold tea? 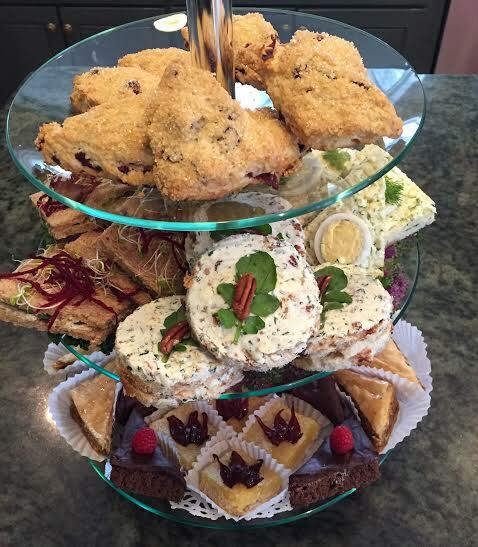 Let us serve you both our Gourmet Hot Breakfast in our sunroom where songbirds serenade and entertain. Stay at Songbird Prairie with your mom in the Purple finch or Warbler suites and make her a bracelet of hand-blown glass beads and silver-plated metal beads which are topped off with a touch of rhinestone bling! Bracelet included in package with beads of your choice up to $50.00 retail value. Package starts at $249.00 Children 12 and over welcome for this special. Can’t make it overnight? Come for Breakfast, Afternoon tea, ( 4 person minimum) or spa treatments. Make your reservation today or buy a gift card! Experience Afternoon tea while the birds serenade and entertain you with their antics just outside the sunroom windows. Labels: Afternoon Tea, Afternoon tea with spa services, Tea Room near Chicago. 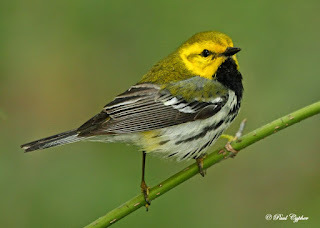 The Black -throated Green Warbler visits Songbird Prairie Bed and Breakfast here in Northwest Indiana in the spring. Easy to identify both by sight and by voice, the black-throated green warbler brings spring, summer, and fall cheer to many birders. Listen for its wheezy-zee zoo zee or zee zee zee zoo zee song. Both the male and female black-throated greens are colorful and easy to identify. This bird often appears in trees high above your head, but even a quick side or belly view reveals important identification clues, such as the bright yellow head framed from below by sharply contrasting black on the breast (and throat on the male) and from above by olive green. The sides are streaked in black and the birds sport two white wing bars. They also have a yellow bar that runs across their white under-tails, or vents. The warbler breeds primarily in coniferous and mixed forest from as far as British Colombia, east through the Northwest, and down into the Appalachians. A few winter in southern Florida but most migrate to Mexico and Central America. During migration black-throated green warblers are among the most conspicuous migrant warblers, actively foraging along woodland edges. 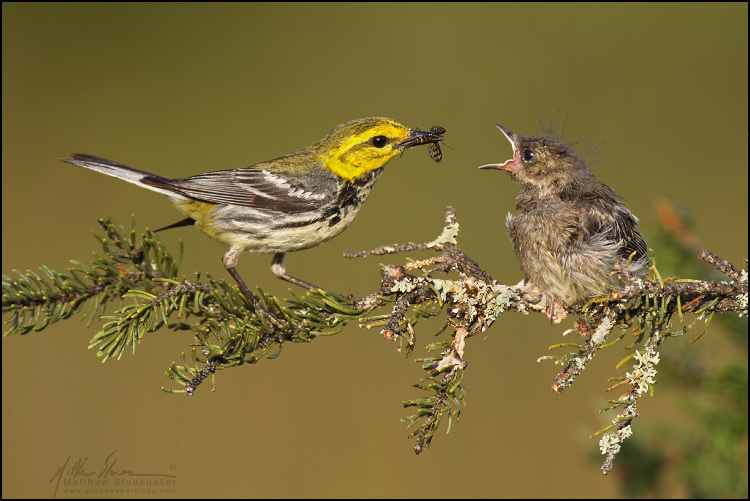 While nesting black-throated green warblers eat insects, particularly caterpillars, they capture prey by snatching it from leaves but also by hovering at the tips of branches to locate and grab insects. During migration poison ivy berries are among the fruits eaten. There are plenty here at Songbird Prairie Bed and Breakfast to our dismay but to the warbler's delight! 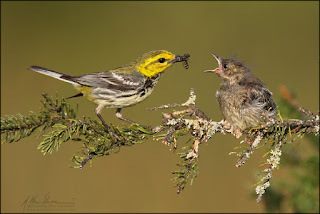 Male and female black throated green warblers share nest building duties, making a cup of grassy stems and twigs, spider webs, and bark which they line with softer materials such as feathers. This construction may take up to eight days and the female seems to choose the nest site, which is frequently between three to nine feet off the ground in a conifer, where two or more branches meet the trunk. Only the female incubates the four eggs, usually for 12 days. 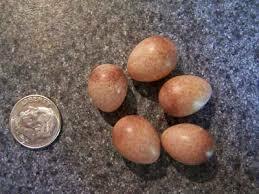 The eggs are grayish or whitish drizzled with reddish brown markings. Females feed the young initially, joined after a number of days by the male. Young leave the nest after about 11 days, following one of the parents for about a month. During migration the black-throated green warbler flies in flocks with chickadee and titmouse. 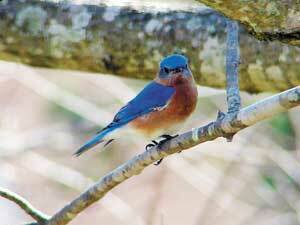 We would love to have you come to Songbird Prairie here in Northwest Indiana to see all of these marvelous birds. The apple trees are in full bloom the last week of April around the windows of the sunroom. Pansy faces greet you as you come up the walk as well as daffodils and bleeding heart. Bring your walking shoes and binoculars!